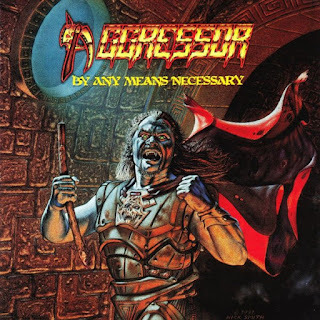 Audio: "Living On The Edge"
Album: "By Any Means Necessary"
Δελτίο τύπου: «Helstar, S.A. Slayer, Juggernaut, Militia, Watchtower... Texas gave birth to a bunch of excellent heavy metal bands. Some of them became well known on the international scene, and some of them are known to a small circle of die hard followers only. Hard to say what would happen to Aggressor if they would release more than just one album in 1992, or if they would release it on major label back in the day. But one thing is sure: "By Any Means Necessary" is a piece of traditional US heavy metal of the highest quality. Massive rhythm section, aggressive riffs, great vocal lines and great solos - sounds like a recipe for a perfect heavy metal album, doesn't it?